The best thing a high-level athlete can do following a loss in a big tournament is take advantage of any second chances that happen to present themselves. G’Angelo Hancock (97 kg, Sunkist) kept that mindset going into Day 2 of the 2019 Zagreb Grand Prix and earned an impressive, if not statement-making bronze medal. 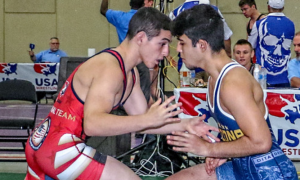 The morning session of the 2019 Zagreb Grand Prix began at 10:30am local time in Croatia (4:30am EST) and streamed live in the US on FLOWrestling. Hancock defeated both Abolfazi Seyedmahdavi (IRI) and Lee Se-Yeol (KOR) on Saturday before dropping an odd bout via fall to Ilya Borisov (RUS). But because Borisov had advanced to the weight class final, Hancock received a shot at redemption in Sunday’s bronze medal match. His opponent, last year’s Zagreb Grand Prix champ Adam Varga (HUN), figured to represent a tough out but Hancock managed to stay one step ahead throughout the contest, and capitalized on a crucial opening when he needed to most in the second period. Following a bit of jousting in the tie-ups, Hancock measured his pace and wore inside on Varga. It was enough to garner the first passivity/par terre chance of the proceedings, though Varga defended from bottom. It stayed this way through much of the opening period; Hancock digging and prodding with Varga often caught on his heels. But it was only a 1-0 lead for Hancock entering the second, a precarious spot to be in should passivity have become a factor. Thing is, it did become a factor, in Hancock’s favor — a most welcome surprise given the current tenor of the sport. Up 2-0, Hancock assumed top and circled around for a front headlock. Rather than roll laterally, or arch and yank over his shoulder, he instead stepped forward — a slightly modified “Korean front headlock” that saw Varga have no choice but to capitulate. Two more points went in Hancock’s direction and he was on his way boasting a 4-0 lead. Varga chipped a point via step-out following a reset, though Hancock dug back into the trenches in prime position. The clock wound all the way down soon enough, and there it was, Hancock earning a bronze medal at the first “Ranking Series” event of 2019. 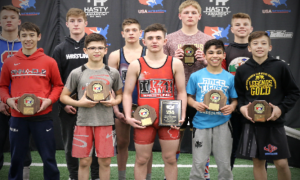 With the medal, Hancock now holds 20 “Ranking Series” points, which should elevate him into the top-10 of United World Wrestling’s rankings. 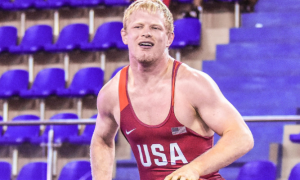 Working to earn his first major Senior overseas medal was 2018 U23 World Team member Travis Rice (63 kg, IRTC), who was defeated by Islomjon Bakhramov (UZB) in his first and only match on Saturday. Rice’s opponent in the bronze round was just as good, 2016 Golden Grand Prix runner-up Firuz Tukhtaev (UZB). The tempo was high from the get-go, mostly because of Rice, as he commenced firing off from a variety of angles. 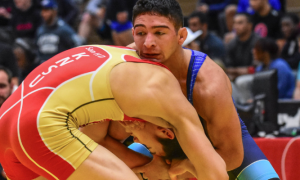 Still, Tukhtaev got behind for a takedown and followed up with a gut to take a 4-0 lead — until the US challenged the turn. After a review, the gutwrench points were wiped off the scoreboard and Rice resumed his charge down by only a pair. Rice stuck to his game plan, moving Tukhtaev around as best he could. Not easy to do, especially with his wrists and fingers constantly being held. The first period came to an end with the US behind by just two. The same prescription from the first frame escorted Rice onto the mat for the second. He was darting, trying to work back inside, and at least seemed more willing to engage. That didn’t stop the passivity fairy from making an appearance, and as such, Tukhtaev was awarded a point with a chance from top. As was the case in the opening period, Rice initially defended; but Tukhtaev effectively re-adjusted his lock, eventually rotating his gut three times for the 9-0 tech. 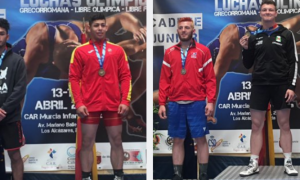 Three athletes were getting their starts on Sunday in the repechage round, and unfortunately, all three were unable to advance further. John Stefanowicz (82 kg, Marines) tried to bring a pressure-happy approach to Jalgasbay Berdimuratov (UZB), somewhere in there flashing a nice look at an arm throw. Berdimuratov kept his feet but a passivity was soon called, giving the Marine a shot from top. After Berdirmuratov defended and a subsequent restart, the match’s momentum swiftly changed. A drag from Berdimuratov scored two and he followed up with a pair of guts to surge ahead 6-1, holding that lead into the second period. Stefanowicz came out with the same intensity in which he began the match, and picked up four on an arm spin to cut the deficit to 6-5. More pressure, more attempts. Berdimuratov was blatantly blocking but not a passivity, not even a warning from the officials, factored into the equation. A tough one-point loss for Stefanowicz ended his Zagreb Grand Prix run at 1-2 after notching an impressive win over 2018 U23 World silver Rajbek Bisultanov (DEN) on Saturday. 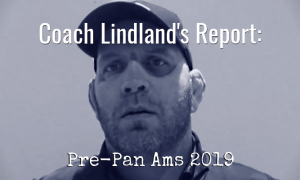 Kevin Radford (87 kg, Sunkist) might not have scored a victory on Day 1, but thanks to Zackarias Berg‘s (NOR) advancement into the finals, the former Arizona State grappler was given new life in Sunday’s repechage. Unfortunately for the ever-improving Radford, this one didn’t go too long. Dogan Goktas (TUR) nabbed a takedown, two guts, and a lift to put the match away at 10-0 early in the first period. 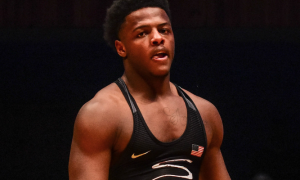 The still-young “Big” Nick Boykin (97 kg, Sunkist) had engineered a sparkling win via fall over Kim Seung-Jun (KOR) yesterday before dropping a tech to eventual finalist Borisov, hence his place in the repechage this morning. His opponent, Varga, offered a sizable advantage in the experience department, and it showed. An arm drag for a takedown and three concurrent guts dispatched Boykin in the first period. 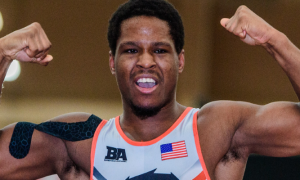 REMINDER: US National Team member Xavier Johnson (63 kg, Marines) is going for gold against Bakhramov later this morning, with the finals scheduled to begin at 11:30am EST.